Nowadays, not having a presence in the mobile-accessed web or not giving users a decent mobile experience is a liability. Having a mobile version of your site or a complimentary mobile app is a tremendously great idea, but execution is never cut and dry. There are actually many things to consider, and exactly how your site is developed is one of those considerations. We’ll go over the three biggest ways to get your content mobile. native Apps are essentially software programs that are created to run on a specific platform. This approach offers great user control, access to all the phone features (gps, camera, etc), offline access, and great performance. Native Apps fit the phone like a uniquely tailored glove, and that is also part of their problem. See, an app developed for the iPhone (43% of US market share) isn’t going to work on an Android based phone (48% of US market share.) To reach the broadest swath of users and customers, you’ll have to ask your developers to essentially develop two apps. This can really start to cost, and if you’re not prepared to aggressively market and produce a quality piece of software, proceed at your own risk. That said, if you’ve got a great idea for a game, travel, or social media app, native app is a great way to go to for a great user experience. Responsive Design, a rapidly growing trend in traditional web development is built on the principle of “websites should work, and provide a great user experience, on any device a user uses.” Using a series of techniques that resizes content and/or alters the layout based on the resolution of the device being used, developers and designers can create one website that looks like it was built for a desktop, tablet, and phone all at the same time. The beauty of this approach is that it is an elegant solution to the explosion of variety in screen sizes. No matter what platform or resolution, the site is going to look like it was built for that screen. And this makes this choice the cheapest. You essentially build a website, and get a mobile version as a bonus (or in the case of “mobile-first” philosophy, you get a traditional website for free.”) What you don’t get is access to phone features like gps or camera, and because it is traditional web development essentially, you are shackled to the browser the user wishes to use. A lot like the mobile website, a Web App is essentially a website that your user is redirected to after putting in your url. Instead of interacting with your website, they are taken to an HTML5 based application optimized for running on a mobile device. Not quite as robust as Native Apps but with more features than a mobile website, a Web App provides a middle way to reach users with both accessibility and interactivity. Using applications like the open source PhoneGap or the proprietary Sencha to build the application, Web Apps can get to most of the on-board features of the phone (both android and iPhone platforms simultaneously.) 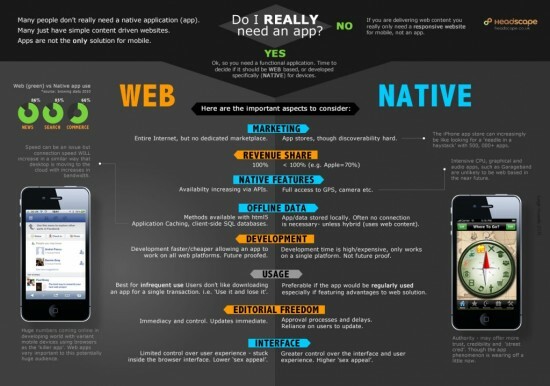 This means your web-based application can act like a native app, but you’re still shackled to a browser. That, and a cost that is only slightly less than a Native App are the tradeoffs for being so versatile. While there are a lot of things to consider before you even get to the design and development of your mobile presence, getting mobile is becoming more and more imperative in today’s increasingly less desk-bound world.